Turn left at the yellow and black sign! On Friday 2/22/19 Split Aspen $22.00 per row, available while supply lasts. NO DELIVERY SERVICES ARE AVAILABLE AT THIS TIME. Note: May have smaller unsplit logs in packages. BULK FIREWOOD CURRENTLY SOLD OUT SPLIT AVAILABLE FOR PICK UP ONLY. Please call to check availability. The split firewood may have unsplit logs smaller than 5" diameter. Delivered and dumped : Delivery not availble until further notice. Within 15 miles, (does not include canyons) add $65 to 1st cord and $10 each additional cord, up to 3 cord per trip. We deliver to other locations and up canyons, please call for pricing. Firewood gets backlogged in August and September. Place an order and we will call you when we get to your order to schedule the delivery. Fall and winter deliveries are made Sept through February and delivered in the order they were received. 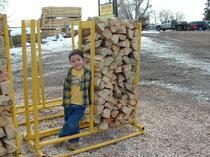 Slabwood, 8 foot lengths - mostly pine (may have aspen/spruce/fir) picked up $45.00 bundle, currently has a waiting list.